UPDATE: 1-23, 3:10 p.m. est. The last thing I want to do is spread fake news from the MSM. Trump has said today that FBI Director Wray never threatened resignation to Sessions. That story is here. The question remains however, why is Wray allowing Strzok, Page and others to remain on duty when clear bias to the President has been exposed and questions of national security and a coup against our very Republic is in question? Even Mueller had the good sense to understand that the optics of having Strzok and Page on his team doesn't work to his favor and cut them loose. 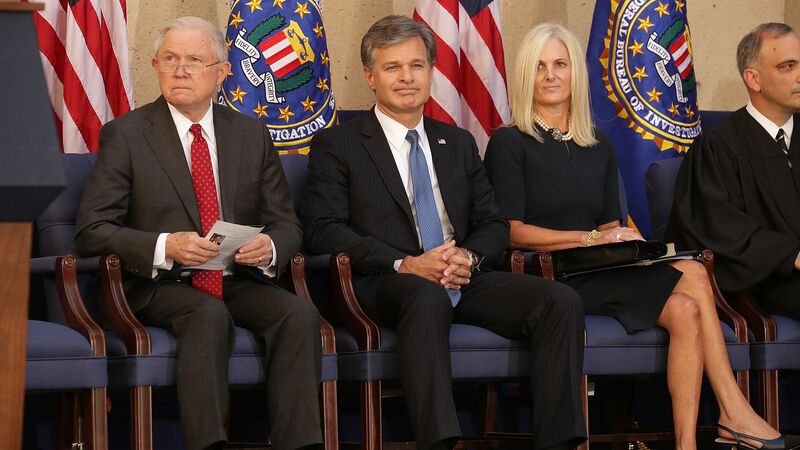 While it is encouraging to finally read a positive report on AG Sessions, it is rather unsettling to hear Wray, the Director of the FBI, being so absolutely devoid of leadership. The VERY LEAST Wray should do is to immediately suspend without pay, pending investigation, the actors we know are involved in covering up Hillary's crimes and SPYING on the opposition party, including the President-Elect himself. I am speaking of Andrew McCabe, Bruce Ohr, Peter Strzok, Lisa Page and Rod Rosenstein. And who is to say, they are not still spying? -W.E. Wray's resignation under those circumstances would have created a media firestorm. The White House — understandably gun-shy after the Comey debacle — didn’t want that scene, so McCabe remains. Why it matters: Trump started his presidency by pressuring one FBI Director (before canning him), and then began pressuring another (this time wanting his deputy canned). This much meddling with the FBI for this long is not normal. McGahn has been informed about these ongoing conversations, though he has not spoken with Wray about FBI personnel, according to an administration source briefed on the situation. Trump nominated Wray, previously an assistant attorney general under George W. Bush, last June to replace James Comey as director. Trump has also tweeted negatively about other senior FBI officials who are allies of Comey, including the former top FBI lawyer James A. Baker who was recently “reassigned” after pressure from Sessions. As I reported last night, Sessions has adamantly urged Wray to make a "fresh start" with his core team. Trump and other Republicans have been hammering McCabe — who was selected by the White House as acting director after the Comey firing — for months on Twitter. The latest: The New York Times — and others — reported in December that McCabe "is expected to retire after he becomes eligible for his pension [in] early ." But senior Justice officials are still not sure what McCabe plans to do. The FBI declined to comment for this story. Justice Department spokeswoman Sarah Isgur Flores also declined to comment.